Everyone knows Godzilla, the King of the Monsters, and most people can recognize Mothra or King Ghidorah as Japanese kaiju of note. But here’s a list of often overlooked or mostly forgotten creatures. 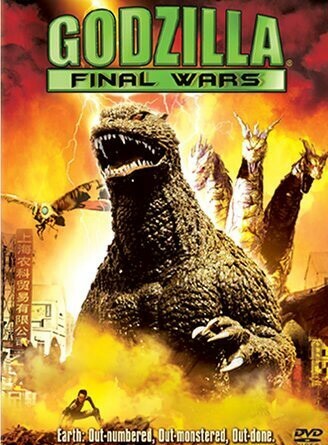 This could also be called the loser gallery of kaiju found in the Japanese Godzilla films. These poor monsters get no respect and sometimes don’t deserve any, but let’s give them a nod if only to laugh at their humiliation. Let’s start at the very bottom. Technically, Zilla is the Godzilla of the infamous 1998 Roland Emmerich remake. Toho wanted to make a distinct differentiation between their true Godzilla and the American counterfeit, um, I mean counterpart. 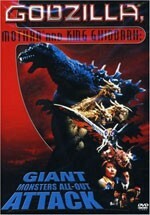 Japan’s disdain for Zilla comes through loud and hilariously clear in an aside made in Godzilla, Mothra, and King Ghidorah: Giant Monsters All Out Attack when someone asks wasn’t Godzilla spotted in New York, and the reply is, “Well, the Americans seem to think so, but we’re not so sure…” Then in Final Wars Zilla appears and is ignominiously disposed of in less than 30 seconds by the true King of the Monsters. Then to add salt to the would, the Controller of Planet X says, “I knew that tuna-eating monster was useless!” (The tuna reference is to an infamous scene in the 1998 Godzilla.) This has to be the bottom feeder in Godzilla’s kaiju hall of shame. 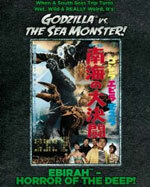 This poor kaiju not only gets left out of the title for the film but he fails to even merit a name. That’s a sure sign of being a loser in the kaiju world, it means you have no personality. He’s nothing more than a mutated bird without any special powers. He’s also left out of the trailer and is quickly disposed of by Big G as no more bothersome than a mosquito. Forgettable. Here’s another sorry soul, a regular creature that tries to increase his kaiju status simply by adding the adjective “Giant.” Poor Giant Lizard, like Giant Condor, is not acknowledged in the film’s title (nor should he be!) and doesn’t get a name. Plus, he is listed on the Wikizilla as the only Godzilla monster NOT to have a toy. Seriously? He better be hanging his reptilian head in shame. Seeing a pattern here? Here’s another loser from King Kong Vs. Godzilla that’s also nameless and left out of the film’s title. He’s not even a man in a suit as most of the kaiju are, but rather a real octopus (with occasional stop motion animation) slithering over a miniature set. He doesn’t even seem to have a purpose in the film except to up the monster ante. Then to add insult to injury, this Japanese monster is not even killed by Godzilla but rather bullied out of the film by the American monster, King Kong. Embarrassing. Known as Gimantis (which seems to come from combining “giant” and “mantis”) in its first appearance, these big bugs came as a trio in Son of Godzilla. They get caught by Big G trying to crack open baby Godzilla’s egg to eat him. That doesn’t please the Papa. He immediately kills two and a third flees only to be eaten later by a giant tarantula. They were originally man-sized mantis but an atomic storm mutated them to more of a small skyscraper size. In Final Wars a fourth one appears only to be impaled on an electrical tower. Kind of embarrassing. The fact that there were multiples of them, and they were not able to develop unique personalities makes them inconsequential. Meganulon (which turns into Meganula) is another insecty kaiju that’s just not that interesting and can be lumped in with Kamacuras here since it too lacks personality. A giant arachnid that’s a nemesis in Son of Godzilla but then seems to undergo a change of heart and comes to earth’s rescue in Destroy All Monsters. As with Kamacuras, Giant Octopus, and Giant Condor, this kaiju drops down on the monster ladder for merely being a large version of something that exists in real life. That’s not nearly as fun or imaginative as a creature like Hedorah or Biollante that has no counterpart in the real world. Points docked for only appearing in one film and for looking quite ridiculous. Named after a real dinosaur, Titanosaurus sports a fin on his back that continues to an orange-ish crest on his head that gives him a silly punk rock look. He was also under mind control, which robs him of being his own monster. Manda is a giant radioactive sea serpent possessing death ray powers. He’s only in one Godzilla film and has minimal screen time. He’s an ally to Godzilla in Destroy All Monsters and survives the kaiju battle royale to return to Monster Island. His head looks a bit like King Ghidorah’s but he has none of Ghidorah’s epic stature. Plus he has those silly little legs. He fades into the background in a film that simply has an embarrassment of kaiju riches. Also known as the Sea Monster, Ebirah seems to get a name almost as an afterthought. That can’t be good. The name is taken from the Japanese word for shrimp but he looks more like a crayfish or lobster. He may get his name in the title and he may get brought back for Final Wars but a giant shrimp just isn’t all that cool or menacing even with giant claws. 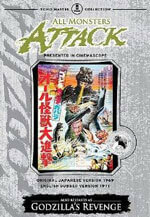 Crustaceans are fine for sushi but have no place in a monster movie. I know. Some people love King Caesar. Godzilla comes to his rescue, which gives him some kaiju status, and he has his own song (like the vastly more popular Mothra) so he just barely makes the list. His downside is that he’s a lethargic beast and has to be woken up from a deep slumber to even partake in the film. He’s only made two movies (a third if you count a stock footage appearance) and he’s the only kaiju with ridiculous boobies. The silliness doesn’t end there: he looks like a cross between the Cowardly Lion and a scrappy pound dog, and he’s prone to hibernation (which is dull). This is one sad puppy. (Dis)Honorary mention: I will bring up Minya (a.k.a. Minilla) — seen in Son of Godzilla, All Monsters Attack (Godzilla’s Revenge) and Final Wars — because he draws such polarized emotions among Godzilla fans. They either hate him or love him. The haters consider him a mutant Barney reduced to slapstick antics and can’t bear to watch him. But others embrace his ridiculous design as a product of the times and can enjoy his goofy screen presence. As the son of Godzilla he kind of gets a free pass to look any way he wants and to do anything he wants. The son of Godzilla becomes a far more impressive lad in Godzilla Vs. Destroyah – where he is redubbed Godzilla Junior – possibly because the implication is that after Godzilla dies the franchise will pass on to Junior. I highly recommend checking out Wikizilla for hours of endless fun looking at kaiju photos and reading geeky facts about the lamest to the most awesome of Japanese beasts.